Scientology study programs range from introductory Scientology courses to training as a Scientology auditor (the title for a Scientology spiritual counselor) to the study of the most advanced aspects of Scientology scriptures where one gains vastly increased awareness and spiritual freedom. Are there any answers to the human condition? Is man really just an animal, whose emotions and ethics are controlled by genes or chemical reactions in the brain? The answer to the first question is yes, and to the second is a definite no. 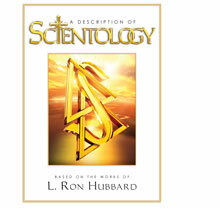 L. Ron Hubbard, the founder of the Scientology religion, discovered many truths about the mind and life. He also recorded his discoveries in such a way that others could easily learn to use them, both to improve their own lives and to help their fellows. One of the most important of his discoveries is that you are a spiritual being endowed with abilities well beyond what you have been led to believe. You can recover those abilities, gain an understanding of life, and help your friends and family through Scientology training. Unlike many other religions Scientology is a practical means of improving all of life, from the handling of relationships, stress in the workplace and anxiety over factors in life that seem dangerous or out of control, to the accomplishment of happiness and true spiritual freedom. Your happiness is important. Your ability, self-confidence, friendship and help have everything to do with how well your friends and family survive. Scientology actually gives you tools you can use in life to improve any condition and help others. The problems of modern life may seem enormously complex, but from your first Scientology course you will find simple and basic truths about life that will give you a way to resolve them. Scientology does not depend upon a system of beliefs or faith. The emphasis is on an exact application of its principles to improve life and the world in which we live. In Scientology introductory training you address those things about your life that you really want to change. This can range from aspects of your personality, to improving your relationships with others, to learning basic Scientology techniques you can use to help friends or family deal with problems in their lives. Because of the unique methods L. Ron Hubbard devised for studying, students study Scientology materials at their own individual pace. All the practical techniques used by Volunteer Ministers are drawn from the chapters of The Scientology Handbook. Combined, these chapters provide all the tools you need to confront and resolve virtually any life situation&em;from ending marital strife to recovering a friend from drugs to managing a company for optimum success. In order to make these chapters and the technology they contain as available as possible, Scientology courses covering each individual chapter are now available in a free, easy-to-use online format, supervised by trained professionals. Many people who have read Dianetics: The Modern Science of Mental Health by L. Ron Hubbard want to know how to get started applying Dianetics procedures. That is why Scientology churches and missions and Dianetics foundations offer free Dianetics Seminars. Scientology churches and missions offer The Personal Efficiency Course. Life is composed of seven-tenths work, one-tenth familial, one-tenth political and one-tenth relaxation. Here, then, is Scientology applied to that crucial seven-tenths of existence. The Personal Efficiency Course contains the senior principles and laws which apply to every endeavor, every problem of work. For they are the discoveries which lay bare the core of these problems and explain the very fabric of life itself. You know how you really want your life to be. You don’t have to settle for less. Scientology Life Improvement courses were created to help people change those aspects of their lives that really need improvement. These courses provide the know-how you need to change conditions in your life. Each course concentrates on specific skills, enabling you to understand those aspects of life that have been confusing or out of your control, and handle them successfully. They address such subjects as how to improve conditions in life, personal values and integrity, overcoming ups and downs in life, how to improve relationships with others, starting and maintaining a successful marriage, repairing a marriage, how to be a successful parent and how to make work easier. Specializing in specific Scientology technology that applies to the subject, each course is built around an illustrated study booklet that makes it easy to fully understand. The keynote of these courses is application. They are designed to give the student real skill in handling circumstances in their lives, and they contain drills and exercises to make sure you can apply the principles you learn to the very aspects of your life you know you need to improve. This Scientology course will enable you to overcome communication difficulties you may have, and will help you deal successfully with the communication problems of others. By breaking the subject of communication down into its component parts, L. Ron Hubbard was able to devise drills anyone can learn, to improve ability to interact with others. On this course you will learn how to meet new people, how to get someone to talk to you, how to restore communication when it has broken down, and how to handle otherwise uncomfortable or trying circumstances in relationships with others. The Success Through Communication Course is available at any church of Scientology or missions. In his research into the mind and life, L. Ron Hubbard discovered how to help the individuals look at his own existence and improve their ability and awareness. This is accomplished through Scientology spiritual counseling, which is known as auditing, from the Latin "audire" meaning to hear or listen. Have you ever experienced relief just by finding someone who was willing to really listen to you? An auditor is defined as one who listens. Auditors are ministers or ministers–in–training of churches of Scientology who are trained in Scientology to help others. Through auditing, people can rid themselves of their limitations and realize their full potential. This potential is far, far higher than earlier practices and religions ever thought possible. Auditor training is available at all Scientology churches. On auditor training courses the student studies and finds out for himself that Scientology principles work.